Update: On Aug. 31 LEGO posted an apology as comment on YouTube and explained that the takedown notice was a mistake. "Further legal action may be pursued if this situation cannot be resolved." As noted there, I do not believe LEGO is the original source of this threat, though they delivered it fully under their banner (via an agency they employ). As noted there, I am confident this threat is erroneous and unfounded and that I have committed absolutely no wrongdoing in the matter. I will not lose any sleep over this. I will not be calling for a boycott of LEGO or Disney over this. I will not make a video of me smashing LEGO Star Wars sets with a sledgehammer over this. I will not stop reviewing LEGO sets or building my LEGO city over this. Heck, I have not lost any of my passion and love for LEGO products over this. Believe it or not, I have not even lost any of my feeling that LEGO is one of the most very most ethical of the money-minting big corporations in the world. One mistake, how ever aggravating, does not change everything for me just because I was wronged personally. There's a much bigger picture in life in general, and over-reaction based upon personal emotion is nearly always 100% detrimental and non-constructive. Star Wars The Last Jedi products from LEGO and other companies have been appearing on shelves with no checkout restriction at ever more major chain stores across the United States over the past couple of weeks, coast to coast, and are now in the UK & Australia* as well (and even official LEGOLAND stores!!!?!!). In just two short days, these things will be released at even more locations, at which point this whole ordeal will become fully moot and I will bring my videos back from the dead. * As of Aug. 30 evening, user "Black-Key Productions" on YouTube reports that Myers in Australia has pulled TLJ sets from shelves and Melbourne's LEGOLAND Discovery Center has none out. It's good to hear that some attention is being pointed in the correct direction, towards the actual problem. I hope the significant social media buzz about the issue following by my decision to comply with the demands rather than quietly defy them will help reduce the mess of the next big release. Jang you are a solid chap. Level headed and funny even in the face of this event. I want some of your Zen. JANG, I'm really sorry to hear that you had to go through this. You should be able to repost the videos and articles in a couple of days. Just to make you feel a bit better, I'm a LEGO Ambassador, and stuff like this happens with LEGO all the time, but it is usually sorted out with LEGO within the Ambassador Forum, so you don't hear every situation discussed publicly. It is perfectly fine to challenge them, and they regularly make mistakes when they ask for a takedown erroneously. If you craft a friendly and professional response pointing out why you are right, they will apologize and back off. I think it would be really beneficial for you (and LEGO) to request acceptance to the LEGO Ambassador program, and with your channel and following I'm pretty certain you would qualify. It would allow you to communicate with LEGO directly and quickly about matters like this, and also be part of a larger network of very knowledgeable Ambassadors who can help and advise you on matters like this. Thanks for your support and suggestions. The problem with signing up as an official Ambassador or RLUG is that the agreement grants them contractual power that they don't have over unaffiliated, independent individuals. I understand there are many pros and not just cons, but I must insist upon keeping the corporation at arm's length, no matter how good their intentions may generally be. JANG, I appreciate and understand your angle on this. If in the future you ever need to reach anyone at LEGO in situations like this, or have any questions, feel free to reach out to myself or other Ambassadors you may know. We can at least help you get in touch with the right person at LEGO to resolve issues like this quickly, or answer questions, get information, etc. Just know that you have resources available, even if you are not directly an RLUG. Wishing you the best with your future endeavors! I appreciate your attitude very much! And I am sure, you did nothing wrong. But being right does not automatically lead to getting justice... That can be a long and costly journey. So I understand your decision in this case. Keep up the good work. Your positive attitude is inspiring. Glad to hear you're not going anywhere. Your video's are often a point of call before I go out to buy the sets I'm interested in. You're custom work has inspired me to build my own custom big build. So, once again. Thanks for your work and keep it up. Sorry to hear this happened to you. I've had something similar happen to me on a personal project years ago, and it felt heavy handed and unnecessarily harsh. I'm glad to hear you are keeping your cool. Keep up the great work Jang. The release dates for last Jedi is September 1st. So I'm sure LucasFilms/Disney are responsible. Once a theater showed a Star Wars movie a couple hours early and were banded from ever showing them again. "I will not make a video of me smashing LEGO Star Wars sets with a sledgehammer over this". 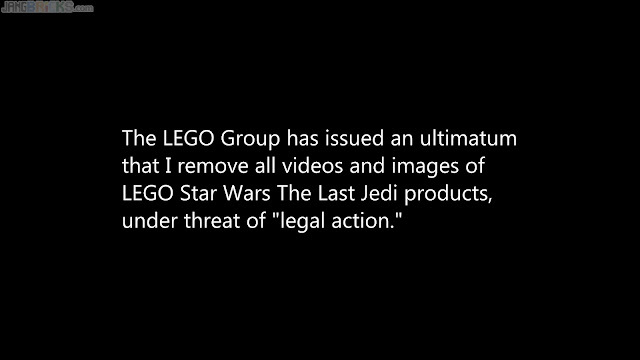 This is made me respect Lego as a corporation they used their power as a corporation to step on a consumer that has done nothing wrong! Jang your videos do an excellent job ay promoting LEGO as a brand most corporations could only dream of having someone like you as fan and content producer! P.S Somehow I suspect this came from Disney not LEGO. it is nice to see a well thought out rational response to this situation. i would hazard a guess it to be due to being put up before the actual release dates and if the videos and such were posted say this weekend all would have been fine. I think Jang handled this expertly and the only way logically possible, all things considered. I hope I have as much wisdom in the face of adversity. These new SW sets have all been "officially" announced now (and are seemingly all over the web) so I guess you're good to go now. I hope whoever sent you the original take-down noticce is proud of themselves. The JANG!!! Our knight in shining armour. Keep up the good work! Mad props for not letting the belligerent bozos get to you. My Mom has always said "it is not WHAT you say but HOW you say it." And I feel certain this is one of those cases. If the communication had been a polite request rather than a threat the outcome would not have garnered such a furor. Perhaps Lego and its agencies can learn from JANG on how to communicate in a professional and polite manner rather than threaten like a petulant bully. I also look to your reviews before deciding to buy a set. You give honest reviews, and the videos, are professionally done. Sorry this happened to you. Your site, and videos do so much in promoting Lego. You should have nevered received a threat to take down the videos, and reviews. Most of us know the why, and it is not Lego. The D people are extremely strict about all aspects of their company. It should have been more clear when merchandise went on the shelf. Thank you for your hard work. I am glad you did receive an apology of sorts.